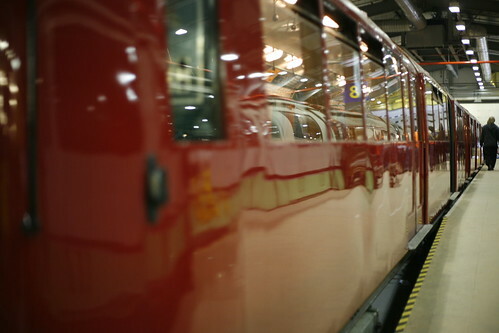 Today Transport for London announced its £9.2bn budget for 2009/2010 as delivering "major milestones" for the Tube, Crossrail, DLR and the East London Line. This is true to an extent but if you scroll down the headline pleasing release, you'll see some London Underground station upgrades have been stalled. Metronet's financial bungling seem to be to blame for the deferral of step free access to the Metropolitan & Circle lines at Baker Street. This was supposed to have been part of TfL’s "commitments for the 2012 Games" to "provide step-free access" at this specific station. 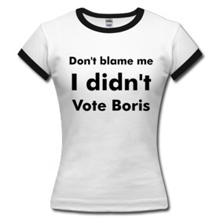 Boris Johnson said "The collapse of Metronet already means that some work must be put back or cancelled, so I will be relentless in making the case to the Government that they should not let other projects falter." The bus based £40 million Greenwich Waterfront transit scheme has also been scrapped. One of the projects that got a go ahead was the re-development of Tottenham Court Road Station which will provide additional capacity & serve Crossrail. Nice to see priorities starting with getting some shiny new advertising in, which I noticed on my way home this evening. Labour group leader from the London Assembly, Len Duvall, isn't wild about the projects and said: "This is the pay more, get less Mayor who raises fares and wastes money on wild vanity schemes but can't find the money for the key transport projects to see London through the recession. Everyone accepts the need for a certain amount of belt-tightening but this should focus the Mayor on the key improvements London's transport system needs. What we are seeing is a shift in priorities away from viable, necessary schemes towards the Mayor's eye-catching vanity projects". 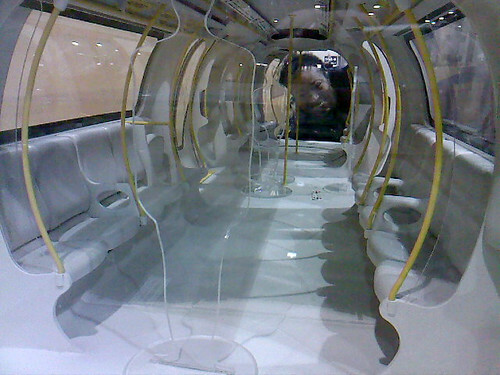 At least we will see the completion of the upgrade of the Jubilee line. This will be delivering a 33% increase in capacity and will serve an extra 10,000 passengers an hour. However, I'm guessing that one of the "vanity projects" Duvall refers to includes the £57m bike hire scheme. I wonder if turning London into a version of Amsterdam, will mean less commuters on the Tube? If so, all well and good. However, it does seem like a shed load of money to invest in a cycling scheme, and it wouldn't tempt non bike riders like me to cycle into work. Two rush-hour London Underground trains came within seconds of crashing on Friday night. A signalman was suspended after the driver of a District Line train saw a Piccadilly Line train passing just in front of him, as he left Ealing Broadway Tube. The District Line train had been brought to a halt, after the driver passed through a red signal. After a few minutes he was given permission to leave & the Piccadilly line train crossed the junction immediately ahead. The driver was obviously shaken but it's thought that the delay after the red light saved the trains from crashing. The Piccadilly Line was travelling at 25mph and both trains would have been derailed if they'd hit. A spokeswoman for TfL said "Safety is London Underground's top priority and we have an excellent safety record." The incident has now been reported to the Rail Accident Investigation Board and the Railway Inspectorate. See Current.com / Metro for more. The investigation will hopefully reveal what happened, but I still don't understand how trains are actually physically able to pass red signals in the first place. 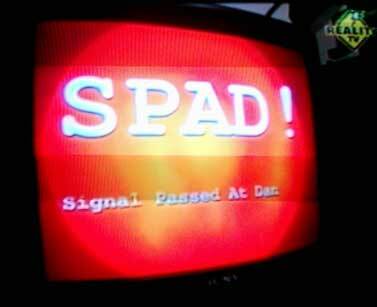 I'm sure someone can technically tell me how this will happen, but I remember being shocked that SPAD's or "Signals Passed at Danger" (the Tube equivalent of going through a red light) could take place. I'm assuming this doesn't happen on the DLR where the trains are all fully automated. It seems to be by luck & driver ability rather than the design of the system that more serious accidents haven't taken place. 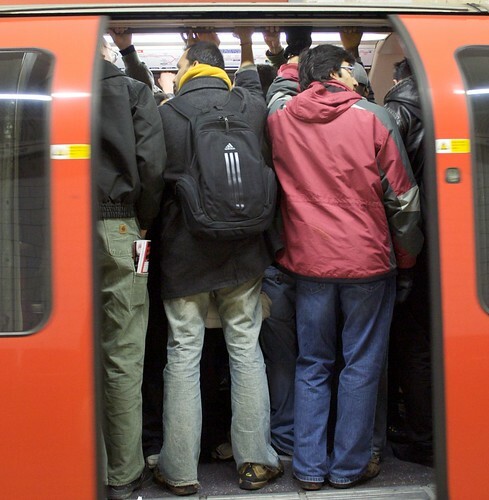 Fewer Tube Commuters - Is it a trend? Although it might not feel like it, there are fewer passengers on the London Underground. 1 million fewer people travelled on the Tube this January than in the previous year, and if this is a trend, it's likely to squeeze finances & mean that fares might have to rise. 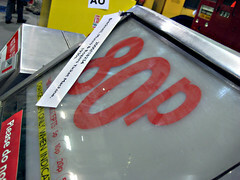 Tony Travers from the LSE told The Guardian "It would be surprising if revenues did not start to come in under target." TfL's budget requires a 3.5% increase in passenger journeys as well as a 7.4% increase in fare income. None of this bodes well for the funding gap I blogged about a week ago. Val Shawcross, chair of the London Assembly's transport committee said the January passenger numbers represented a "worrying" trend. She believes that people are "trading down" to cheaper transport like buses. I think it's early to say whether it is a trend. 81 million passengers is still a lot of passengers and a 1% drop could be seen as a drop in the ocean. But with the current recession and job losses, it makes sense that would be fewer commuters. A spokesperson for the mayor said "In these uncertain economic times TfL will work ... to maintain the right level of investment and affordable fares. The mayor's commitment to deliver value for money is even more critical now. The operational cost review being undertaken by TfL aims to save money as well as ensuring that services remain unaffected." I'm not sure how many people are convinced by this. Improvements are being delayed due to arguments about costs, and if fewer people are travelling, revenues will drop and the funding gap will get even bigger. Dave responded to the funding gap post and said "Nothing seems to be changing, despite all the evenings and weekends of their so-called improvement works. I submitted a request under the Freedom of Information Act to TfL about the (non)improvements at the Jubilee Line. I've copied it here and will publish any response." Let's see how they answer! 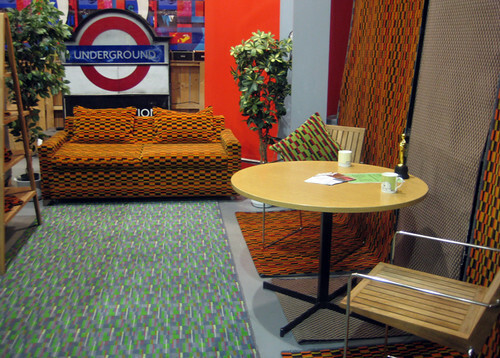 If only someone would bring out a real version of the popular game based on London Underground stations. The wonderful B3ta challenged people to come up with the wrong instructions to something and edz314 produced a Deluxe Edition of Mornington Crescent. It's brilliant. From the modern and old skool game boards to the counters made up of signals & hats. Many thanks to Robbie L for spotting it. Now we just need Mattel or Hasbro to produce it and everyone could play. Anything else missing from it though? I noticed the instructions were a bit on the scant side! An escalator & lift engineer on the London Underground has got a bit of following by re-mixing sounds he's sampled while working on the Tube into dance music. 28 year old Ben Langham carries a digital recorder on the job and captures sounds of escalators, hacksaws, brakes and trains running over tracks. He said "I liked the idea of having this concept, noises from behind the scenes on the Tube which the general public don't get to listen to." I listened to Ruislip Rhythms on Ben's site - Tunnels - and the beginning didn't do that much for me, but after a while it picked up. Whereas the sample from Tunnel Sounds was darker & the engineering sounds worked quite well with the atmospheric mood. Ben's currently working on a album and on his site, you can listen to the following err.. tracks. Every single noise in this track is a field recording. 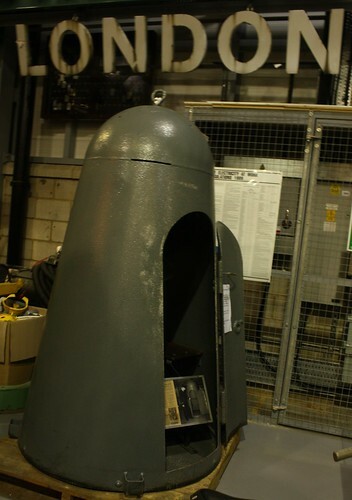 It contains the sounds of relays controlling a lift at Earls Court and various trippy noises from deep in the tunnels. 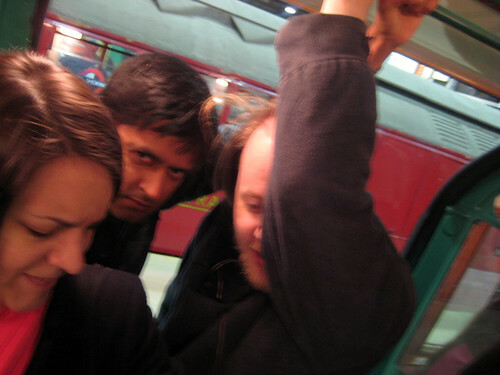 The beat is based around the noise of one of the escalators at Moorgate station recorded from underneath and slowed down. There's a hacksaw and an electromagnetic brake in there as well. The machine that forms the basis of this track cuts running rails to prepare them for assembly. The rail traverses back and forth against a cutter which removes the steel in shavings which you may hear falling on the ground. Whispering, humming and singing are all provided by the wonderful Plum." Not sure if they'll be on my iPod but an interesting concept if you want to take the sounds of the Tube home with you, or dance along to them at a club. 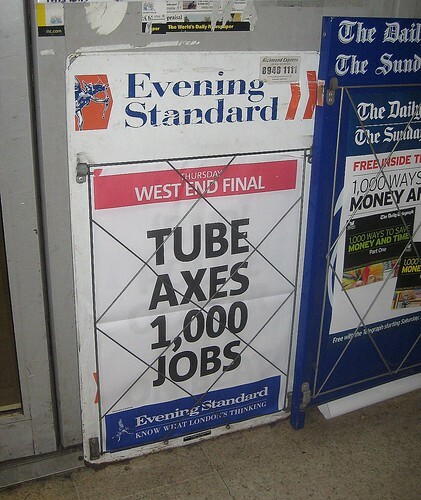 You might remember that in January London Underground announced there would be 1,000 job cuts (mainly made from administrative & temporary posts). Now the RMT union has announced that 10,000 workers will vote over strike action on this and pay from today. The RMT, who believe 3,000 jobs are at risk, want TfL to withdraw the threat of compulsory redundancies. They say this is a part of TfL's plan to save £2.4bn. "If LUL and TfL want to avoid confrontation they should withdraw their plans to slash jobs and guarantee there will be no forced redundancies, start talking seriously about pay and call off the bully managers ." TfL had previously said that the job cuts were not frontline and would not involve a reduction in services. A number of staff commented on this blog that the roles going were duplicates due to Metronet being moved into the London Underground. I got the impression that those particular staff members certainly wouldn't go on strike because of loss of "pointless office drones". CSA Joey went one step further and said "I'm an RMT member and usually support the RMT, but if Bob Crow thinks any operational staff will strike in support of haughty, self-important stuffed suits, he's got another think coming." Let's see how many of the 9,999 other RMT members think the same. The ballots close on the 8th April and the results should be announced soon afterwards. With all of the posters around on the London Underground, you can often get a sense of being watched. So it's no surprise that a few people have taken pictures of themselves interacting with the posters. She said that her friend wanted to make it look like the Iranian gentleman was passing her a cup of tea. 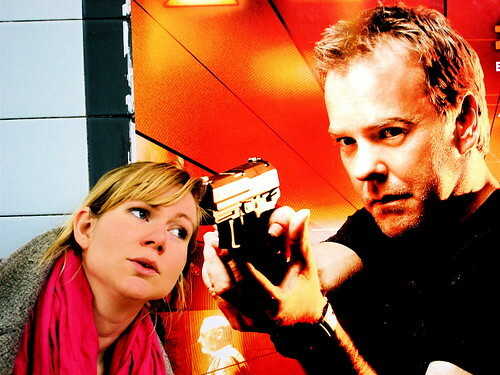 Chutney Bannister's is less playful but it makes for a striking photo, with Jack Bauer busting from the poster. Speaking of subway ads, those pesky pranksters in New York, Improv Everywhere, managed to convince a number of people that they were attending a private art exhibition at station. They put up 30 placards next to objects naturally found on 23rd Street subway platform in Manhattan - pipes, electrical boxes, signs, advertisements - and transformed them into works of art. They realised that there was a lot of art installations at some stations and said "Despite these wonderful authorized and unauthorized works, the majority of the stations are pretty boring and display nothing but ads. Well, at least at first glance. 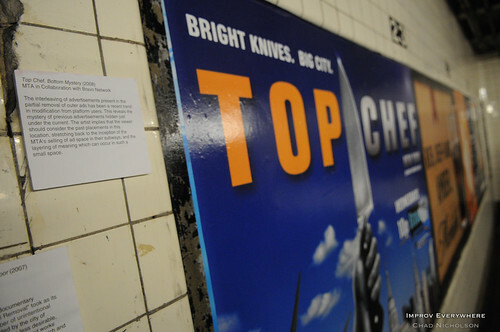 We were able to turn the components of the 23rd Street C/E station into works of art simply by adding placards containing art-speak descriptions." 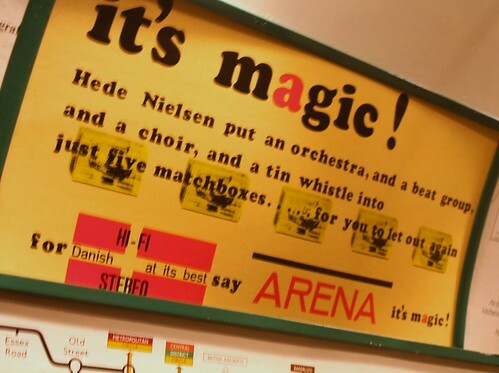 I love the "arty" caption on this poster, as it's like the posters at King's Cross Tube that I blogged about last week. The interleaving of advertisements present in the partial removal of outer ads has been a recent trend in modification from platform users. This reveals the mystery of previous advertisements hidden just under the current. The artist implies that the viewer should consider the past placements in this location, stretching back to the inception of the MTA's selling of ad space in their subways, and the layering of meaning which can occur in such a small space." Seems like people are capable of making underground ads artistic, without the advertisers intending it! The London Assembly has said that plans to ease congestion on the London Underground & improve access to stations are being put at risk due to disagreement about costs. TfL and Tube Lines currently can't agree on upgrade costs. Last September TfL estimated it would cost £4.1bn to carry out improvements on the Tube between but Tube Lines say it will be £7.2bn. A London Assembly reports believe that this disagreement is seriously slowing down work. Their transport committee chair, Val Shawcross, said: "Maintaining and upgrading the Tube is absolutely vital to the capital and Londoners have a right to know how it is progressing." TfL is taking on projects following Metronet's collapse but around half of the 150 refurbishment plans that were supposed to be finished by 2010 have been delayed until 2017. Departing, LU managing director Tim O'Toole said they had resubmitted their contract terms to Tube Lines, who have until June to respond. The BBC report said Tube Lines was unavailable to comment. It will be interesting to see what happens when Tube Lines are available to comment. Val Shawcross, lives in South London, so knows all too well about the scarcity of the Tube south of the river, is right in pushing for updates. She said: "Any delayed or cancelled projects will have a real impact on people using the network." I look forward to seeing the full report, which doesn't appear to be on the London Assembly's site yet. But I suspect that it might take a fair while to bridge the £3bn funding gap between TfL and Tube Lines estimations. "We welcome the findings of the London Assembly's report and the importance it places on having the right levels of funding in place to ensure London has the Tube service it needs in 2010 and beyond. 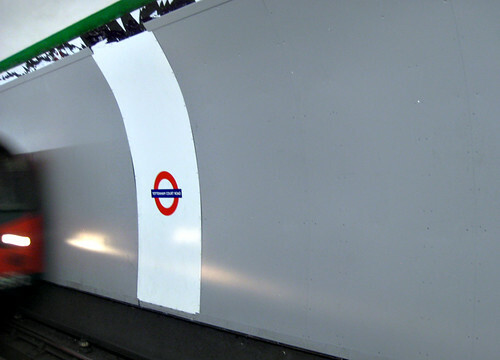 "It rightly notes that we are a well managed business that is successfully delivering vital improvements to the Tube. We can also demonstrate that we are delivering the work in a cost efficient manner, and in many instances are delivering at lower costs than many international metro systems. "There is still so much more to do on the Tube, particularly with regards increasing capacity for passengers and we therefore hope that the funding that is needed to achieve this continues." There must be something about travelling by train to airports that brings out the worst (or maybe the best) in people. Well spotted, Fimb's mate, it's a great picture! 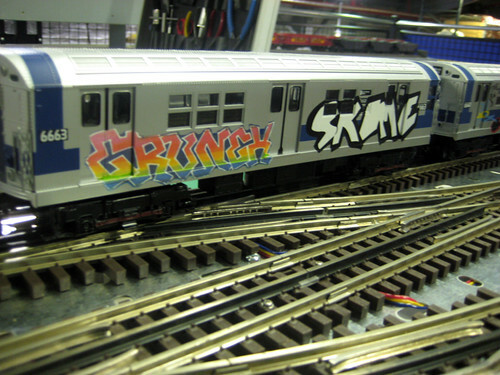 A train operator on the Piccadilly Line has decided to run its entire length of 40 miles. This isn't just so that he can get into work on time, but it's to raise money for the NSPCC and also help him lose some weight. Edward Spencer, weighed 18 stone in June last year and was finding lots of excuses for not keeping fit. He said "One day I was feeling a bit depressed and decided to go for a walk, I walked to Wood Green and bought a book. After walking to Wood Green I decided to walk home and on my return I decided that I quite enjoyed walking, I was sweating like a pig and thought that maybe I might have lost some weight! I went to Argos and bought some scales." Over the past 7 months he lost 4 stone through running & is now going to run the entire Piccadilly Line from Uxbridge to Cockfosters in a day. 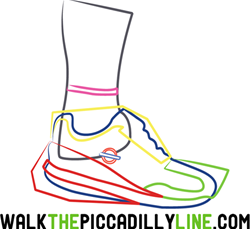 You can follow his progress including a Google map of the route & his training on his blog WalkthePiccadillyLine.com. Edward estimates the run ,which is equivalent to just over one and a half marathons, will take him between 10 and 12 hours. Thanks to version-3-point-one for the heads up to this & if you'd like to support Edward's efforts for the NSPCC here's a link to his Justgiving page. "It is our intention to commence a trial at a small number of Tube stations in late 2007 with the aim of introducing mobile phone and new technology provision at stations from summer 2008." This never happened as it was a bit trickier than first thought. In 2008 we heard "The earliest the trial will begin is in April next year and if it is successful, will be extended across the Tube network. LU said the earliest date mobile phone coverage could be extended across the Tube network is mid-2009." In May 2008, The Inquirer heard that mobile phones going underground was quietly shelved. 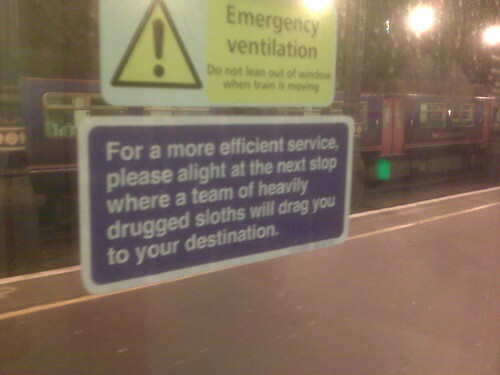 Now, thanks to Ianvisits, I heard that TfL made the following announcement yesterday. "London Underground tendered for a trial of mobile phones on the Waterloo and City line, but the market has yet to provide us with a credible proposal for enabling mobile phone use on the Tube." The spokesperson continued "while it is technically possible to deploy mobile phone and data wireless solutions on the deep level Underground tunnels and stations, the unique nature and environment of the Tube mean that project costs would be prohibitively high at this time." This is probably music to some people's ears, but for someone like me who's used to people using their mobiles on overground parts of the Underground, after all these promises, it's disappointing. Celluar News said "A feasibility study undertaken last year found that having many thousands of mobile phones coming in and out of signal as passengers travelled between coverage zones at stations, and kept dropping signals in tunnels, would overload the phone networks." It's another case where the London Underground is behind other subway networks. Mobile phone coverage works on many other underground systems including Glasgow, Beijing, Stockholm, Washington DC and Moscow. 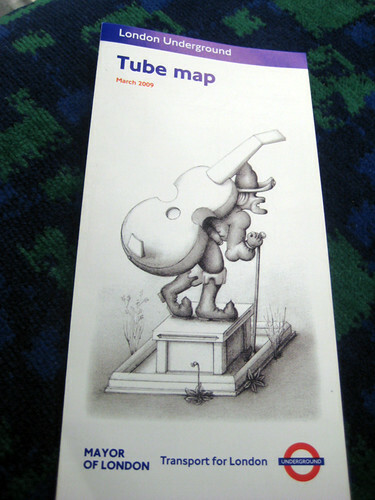 I wonder how "the unique physical and environmental constraints which the Tube presents" differ from those networks? There is demand for the service too. LU conducted a survey in February 2007. Of the 1,007 respondents, 34% said that if it were available they would be very likely to use a mobile phone in all parts of the Tube, including trains and stations. Anyway, the next time I head about mobiles being trialled on the Tube, I'll take it with a massive pinch of salt. I'd never really thought how some of the larger stations on the London Underground are cleaned. So it was amazing to see pictures of a specialist team of abseilers who are bought in to clean Westminster Tube & change the light bulbs. 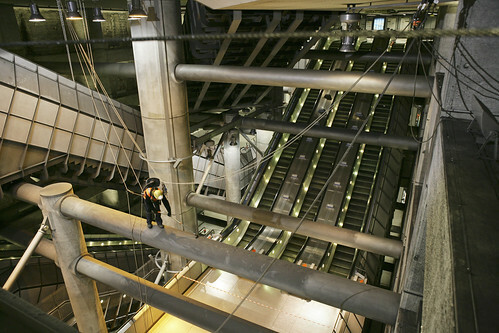 Tube Lines said "To reach many parts of the station like the sides of escalators, pipes and high up empty spaces, specially-qualified cleaners must abseil when the station is closed to passengers. 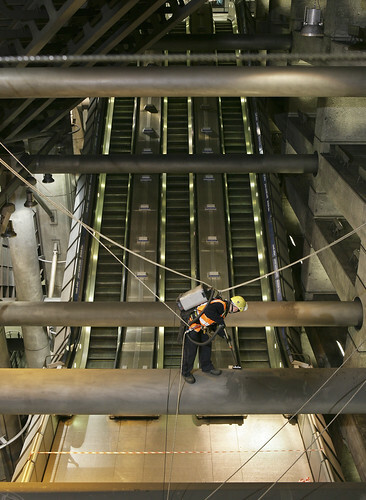 Every year for eight to ten weeks, a team of about four abseilers works its way around Westminster station to clean remote areas and change all the light bulbs. Tube Lines, which is responsible for maintaining the Jubilee line, works with CCS Jeweltone to complete this work." There are more striking, photos of Tube cleaners or Fluffers in a post earlier this year, and they seem to have had a less scary looking task. I'm assuming Tube Lines may have also employed an abseiling photographer with a good head for heights to take the pictures above! Realised that I haven't penned a Friday Fashion Victim blog post all year, in fact the last one I did was in October last year. This is really for lack of fashion victims on the Tube, I've seen my fair share of Ugg boots this winter and a number of people who've clearly "taken a style and made it their own". But I've just not managed to get my camera out in time to get a shot that shows them at their best. However at the end of February, I was lucky enough to sit opposite one of my favourite type of victims. 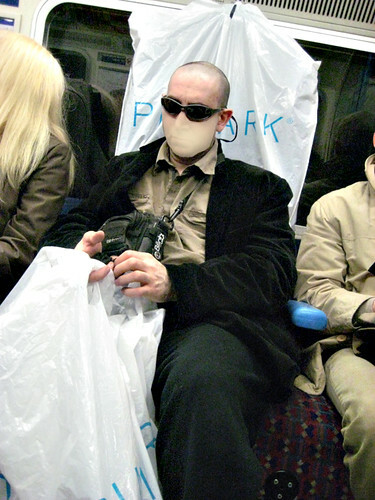 The person who sits on the London Underground travelling through tunnels with shades on. People who wear shades inside, generally need to have a word with themselves, but to do this in winter, when there is no natural daylight or sun in the bowels of the Piccadilly Line, is even worse. This guy had just been on a massive shopping trip to Primark and decided to use the air vents behind him to hang up some of his goodies. I think he was going for the Milan designer look as his sunglasses were on a holder, so he could have easily hung them round his neck, or even popped them on top of his head. But no, keeping them on to give the "I'm possibly a mysterious celebrity with a love of Primark" look, was the preferred option. Until next time, the previous fashion victim post is here and the complete picture gallery of all the Tube Fashion Victims can be seen on the following Flickr set. 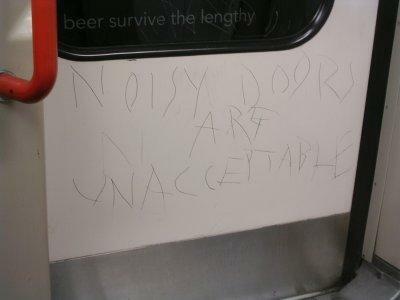 Forget about the noisy doors on the Central Line (see random graffiti below), on Tuesday night, the Central Line platforms at Bank London Underground station were closed because the decibel levels from screeching rails were too high. TfL said "Central Line trains did not stop at Bank station for around an hour-and-a-half on Tuesday evening. "The Central Line platforms were closed following customer complaints about a very loud screeching noise coming from rails as trains passed through the station. "This problem happens on very rare occasions and our engineers worked to resolve the issue as quickly as possible." Jo deBank, from the consumer group London TravelWatch, told the Evening Standard: "I've never heard of anything like this happening before. The noise must have been bad. However, it is certainly problematic to have such a busy station close during rush hour for something that sounds like it could have been easily avoided. It was incredibly disruptive for passengers during an extremely busy time in the evening." However, Earls Court Tube station was served a noise abatement order because its public address announcements were too loud. 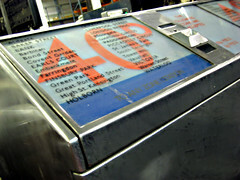 Although TfL say the platforms were closed because of customer complaints, the Standard say that staff had refused to work there because of the noise. 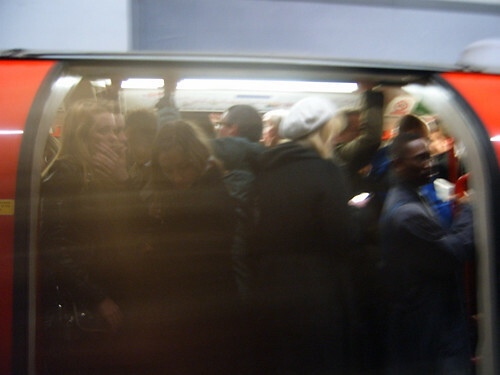 "How bad can it possibly be to disrupt thousands of people on their way home during rush hour? The noise is noticeable at Bank, but you couldn't call it unbearable. It's more of an irritant, really. "Why didn't they just leave it another hour or so and avoid all that chaos? After a hard day at work all you want to do is get home." Finally it looks like King's Cross London Underground station is getting somewhere with the refurbishment works. I used to travel through the station every day and all the badly needed improvement at platform level on the Piccadilly Line, seemed to take forever. 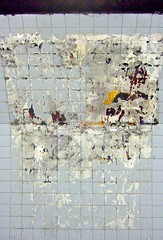 Like me, Martin Deutsch noticed that the platform walls have now been stripped of tiles and posters in readiness for newer tiles & posters. 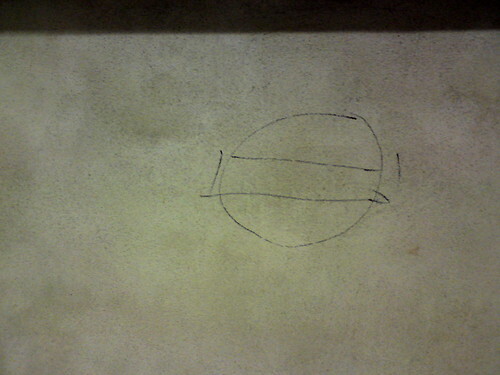 He's taken a picture of the marker on concrete at Kings Cross St Pancras, and said of the DIY roundels which are spaced roughly along the walls, "Probably a hint to the contractors about what they've to put there after retiling." He called this "The Mona Lisa of Kings Cross. Her mysterious smile enchants and her eyes follow you along the platform. Are you warm, are you real, Mona Lisa?" "The walls are all a nice grey-ish brown and have the abrasive texture of fresh plaster. A delicious, warm and earthy experience. ...and is that Grace Jones reaching through the wall wearing a lion's head for a hat?" 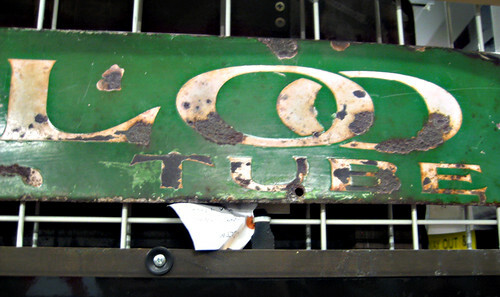 "The ghosts of poster advertising past are dripping from the walls in a gooey mess". Thanks Belfegore for looking at King's Cross in this way. Wonder how long this "gallery" of advertising past will be up before it's all removed & plastered over? 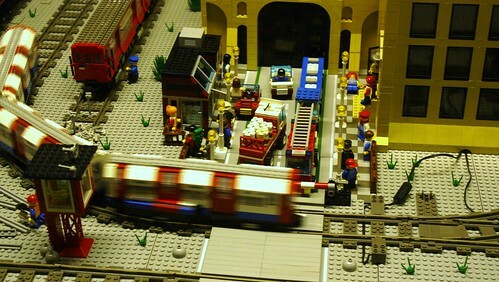 The London Transport Museum have a couple of great evening events this week. 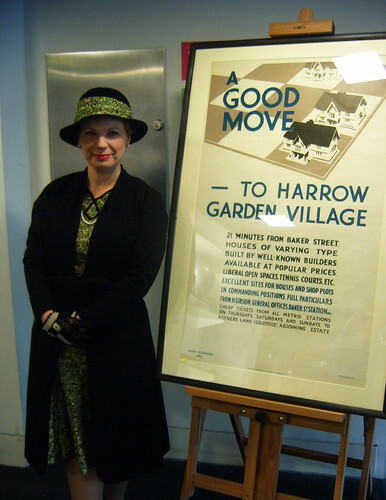 Tonight as part of their The Art of the Poster series, there's a talk by David Bownes, Senior Curator at the Museum on how posters helped people move to the suburbs. "With the rapid expansion of the Underground in the early 20th century, there was an urgent need to attract commuters to the new suburbs. Moving to Metro-land and other lesser known established Underground suburbs was promoted through posters." Last year I experienced a bit of time travel, as the Museum had this fab lady (Mrs Dily Mubridge) who was supposed to be from the 1930's who covered a similar topic from a housewife's perspective. I had an interesting time trying to explain the internet & blogging to her! Anyway, Selling the Suburbs runs from 18.30 to 19.30 this evening. You can book tickets on 020 7565 7298 and they are £8.00 for adults; £6.00 for concessions and £4.00 for students. 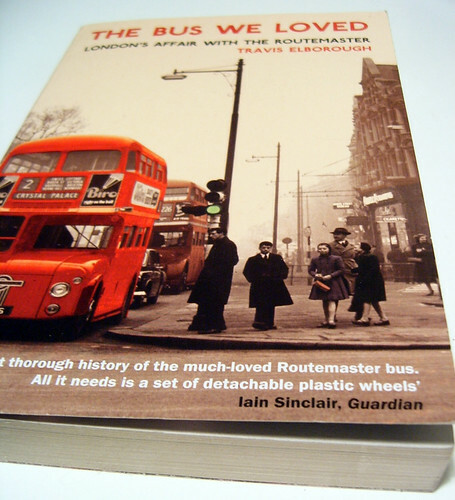 On Friday 13th March there's a Routemaster Rocks night for all bus fans. 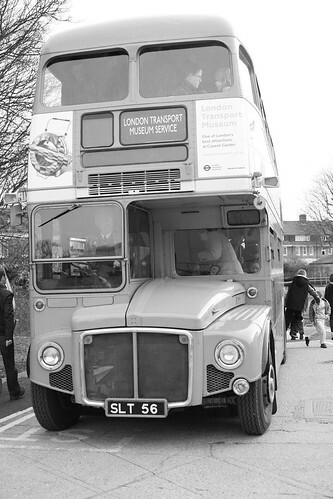 Rather than just wheel in the new bus for London designs, they're being celebrated with an evening of music, films and readings that "rock the city like it's the 1950s." "Live music from electro-skiffle chanteuse Piney Gir, a rock 'n roll DJ set, and a reading from Travis Elborough, author of The Bus We Loved: London's Affair with the Routemaster, and The Long-player Goodbye: the Album from Vinyl to iPod and Back Again ." There will also be a chance to catch a screening of Karel Reisz and Tony Richardson's cult classic Momma Won't Allow – a short that captures the essence of hip teenage cats, flashy youths and chic beat girls in a north London jazz den. 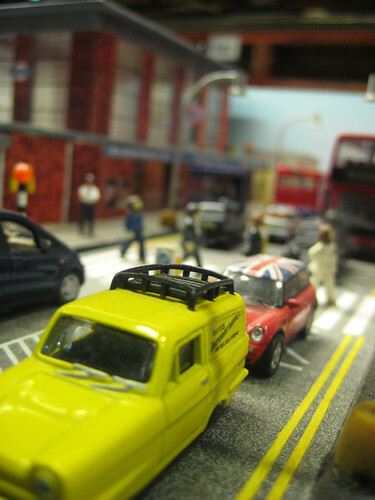 Both events are at the London Transport Museum, Covent Garden Piazza. With Routemaster Rocks, you also get admission to the main Museum galleries with your entry ticket (adults £10.00; senior citizens £8.00; students £6.50) and the musuem will be open until 9pm that night. Call the Museum on 020 7565 7298 for tickets & details of the opening time for Friday. On Saturday we were luckily able to fast track the ginormous queue at the Acton Depot as we were taking part in the Flickr Scavenger Hunt there. I've been to the London Transport Museum at the Acton Depot a few times, but have never seen a queue so long. However, it might not have just been the popularity of seeing the overspill of the musuem's exhibits & mini transport. Fimb reminded me it's been one of the few times there haven't been weekend engineering works on the Tube lines going to Acton on an "Open Weekend" at the Depot! 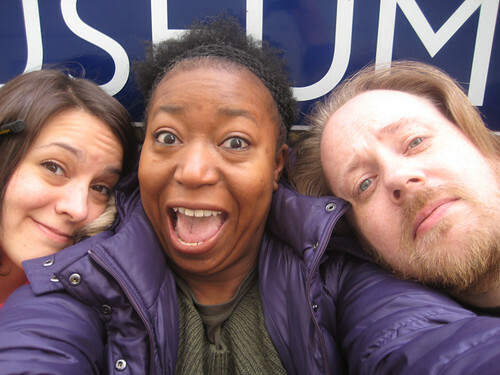 Jemimah, Jon, Dav and myself formed an intrepid team where we ambled round the crowds, trying not to step on small children or knock thermos flasks out of men's hands, in our search of photographic clues. Some of the clues were so fiendishly difficult and we got waylaid just by taking pictures we liked (like the Lego London Underground set above), that I'm amazed we completed as many clues as we did. Plus, Dav got a bit lost on the way there and had a mini tour of the many Tube stations of Acton, taking pictures in their waiting rooms before eventually ending up at Acton Town. "A little bit of the future - going to the stars but underground" was a model of The Space Train, complete with transparent space age men. 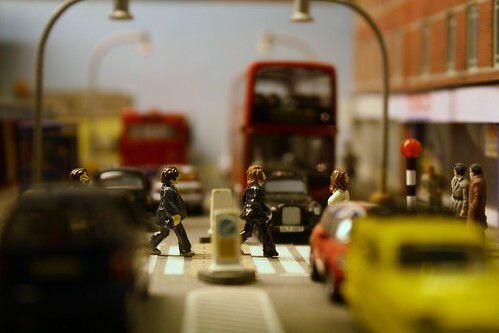 The two pictures above are of "A little big apple rolls down the avenue" which was a miniature display of fictional New York Subway station and its surroundings, complete with a police arrest at gunpoint in front of a giant child. We had fun with some of the clues we got wrong. For example, how else would you interpret "Love me Tender, love me true. When the bus breaks down this'll come for you". 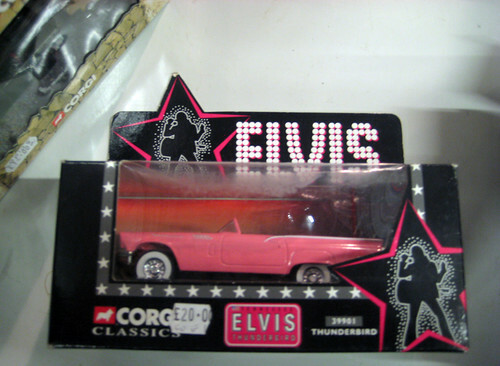 Than with an Elvis car. We were pleased to win a prize for most inventive photo of a clue for this one. We took a break from the exhibits & crowds to do the following shot "Show your group sitting on a bench at a closed station"
However our arms weren't quite long enough to get the full "Museum" station roundel in. Back inside we managed to find "Somewhere to hide when the bombs start falling"
As Jemimah said: "This intrigues the heck out of me. A one person nuke bunker? Doesn't look too hot really. But even if it worked...one lonely survivor. Sad cold object." We also had to find "A doubling of a ticket price in two photos"
Jon said "40p? Tch, that's only a tenth of what a single fare is now". 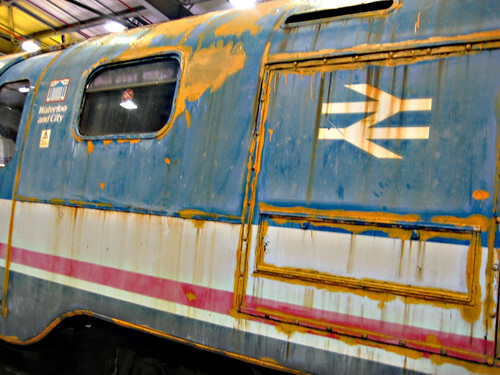 We found a very old and knackered looking "underground interloper from British Rail", in the shape of a Waterloo and City Line carriage. Back in the shiny 1938 stock, we decided this would be a good setting to "Re-enact what it may have been like during the rush hour"
So we got in as much misery and pained expressions as we could. 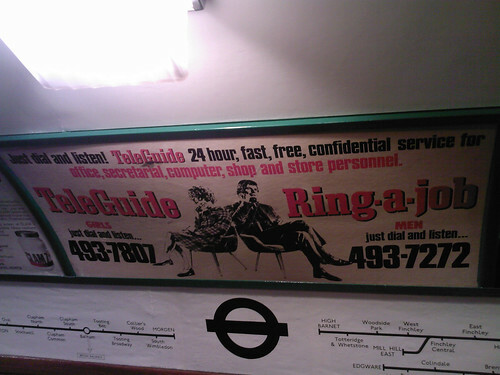 "Astonishing adverts: "Ring-a-job. Men just dial and listen" These days, that costs £1.50 a minute...", said Jon. 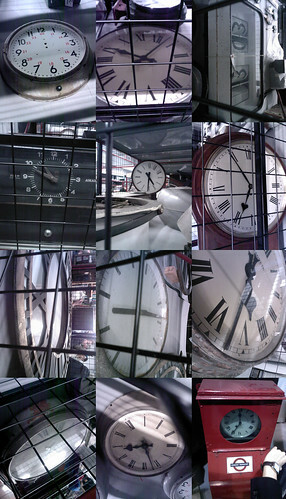 There are many other answers to the twenty "Wordy clues", group photos, targets and picture clues on our sets. So please check them out and comment away on the pictures, as there's still a prize in the offing for best photo: Jemimah, Jon, Dav and myself. Finally some thanks are definitely in order. Thanks to Qype for the prizes, thanks to Cowfish, Mondoagogo and Blech for the inventive clues and thanks to Jane Findlay and the Community Team at the London Transport Museum for giving us a great day out. UPDATE - BTW if you wanted to see the full set of clues and answers they're all on Cowfish's blog. Strangely TfL have broken the theme of using an image with Tube line colours for the new London Underground map cover, which came out a day or so ago. The new cover features a Troubadour struggling under his instrument. I wonder if this is supposed to be a tribute to buskers or generally people struggling with large objects on the Tube. "Ever tried to get a double bass onto a train at rush hour? On the way to an interview yesterday I witnessed an unfortunate young musician attempt just that - I rather think she may have heard a few F# from people she'd made Bflat. 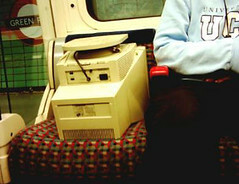 So what's the oddest, largest thing you've ever seen taken on public transport?" It's a good question. 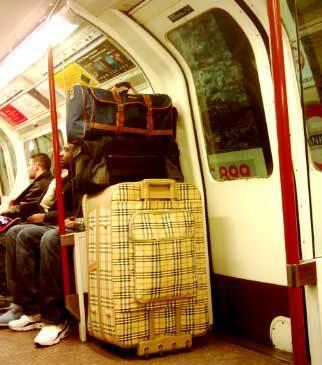 I travel on the Piccadilly Line every day and have seen people with fairly giant sized suitcases struggling with them on the Tube. But it's not really that odd. I seem to see a number of people with computer monitors, but they're not that large or odd either. 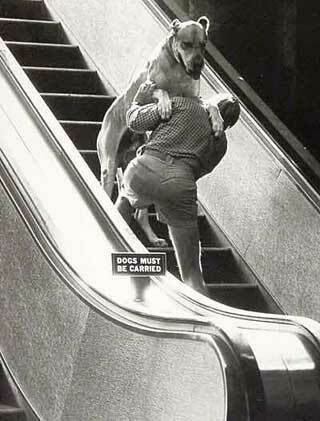 In Germany a guy was spotted trying to carry an extremely large dog on an escalator. 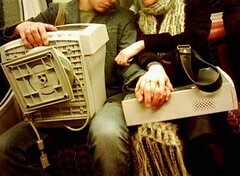 So I'm sure you can top the above, what's the largest or weirdest thing you've ever seen anyone carrying on the Tube or public transport? You've probably seen the ad for 118 118 on TV featuring Ray Parker Jnr, singing Ghostbusters - "I ain't afraid of no goats". Well he's been spotted on the London Underground with a group of beatboxers, with another rendition of the hit. It's another one of those scenes in the Tube where you have more than half the carriage showing complete disinterest and trying to pretend that it's a common occurrence to see an old Motown star with a bunch of beat boxers & the 118 118 characters on the Tube everyday. Many thanks to my colleague Rich M for passing this onto me. Also with Michael Jackson currently in London announcing his curtain call tour at the O2 in July, here's another Tube carriage performance, from February last year, where a fair few commuters hardly raised an eyebrow with what was going on. London Underground have just announced that the Circle Line will be extended to Hammersmith from the end of this year. 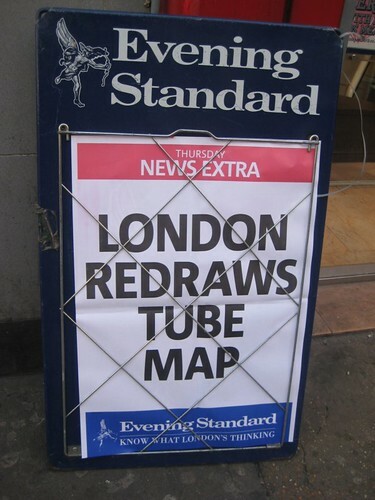 So as the Evening Standard headline refers to, the map will mean the Circle Line will be re-drawn with a little tail coming off it on the left. The new service will run from Hammersmith's Hammersmith and City Line station to Edgware Road station and then join the existing Circle Line at Edgware Road and make a single loop, terminating at Edgware Road station. It will then reverse and do the full circle anti-clockwise, returning to Hammersmith. TfL's site explains further "On the Tube map the Circle line is shown as a single line. However it shares tracks with the District, Hammersmith & City (H & C) and Metropolitan lines and any disruption on these lines can cause delays to the Circle. As Circle line trains currently move around the line without a fixed terminus, any delays are compounded over time, and make it harder to offer a regular or reliable service." No chance of it being named something else though: "It will still be called the Circle line and shown as a circle on the Tube map but with the additional extended service out to Hammersmith." Basically, the changes will almost double the frequency of trains between Hammersmith and Edgware Road. This will be a big help for people travelling to the recently opened Wood Lane Tube station going to the Westfield shopping centre. But, the new service means some passengers will need to change at Edgware Road to catch the quickest train to their destination. Overall, the changes are expected to increase reliability and capacity on the Circle, District, Hammersmith and City and Metropolitan lines. Look forward to seeing whether this is the case in December.